BehavioralOS™ is a set of uniquely-effective diagnostic and development tools developed and distributed worldwide by Temenos, Inc. Leaders and change-agents use the tools to identify and manage the behaviors most important for developing and sustaining high-growth relationships, which in turn fosters a culture of regular open dialogue and high trust. This enables faster change, higher engagement, and better team performance. The tools are powered by a common behavioral platform researched and developed by M.I.T. behavioral scientist Dr. Irv Rubin. They feature uniquely non-threatening processes and actionable data, refined through use by thousands of leaders around the globe since 1985. "Self-awareness is the meta-skill of the 21st Century. The qualities most critical for success in today's world–things like emotional intelligence, empathy, influence, persuasion, communication, and collaboration–all stem from self-awareness." This podcast is for leaders who know that their success is directly tied to the quality of their human relationships. 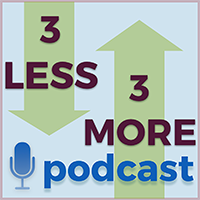 We ask our guests 3 questions: What 3 things should leaders do less of? Accordingly, what 3 things should leaders do more of? Finally, what is the one thing leaders should do every morning before their first interaction at work? And, because we care about you, we cover it all in under 9 minutes.